This section will cover the first story line map of the game to help newbies construct their very first decks as they go through the game. Here are some suggestions that players might want to use or follow for their starter decks. - Pass all duel nodes and treasure nodes to get all free cards. - Doesn't cover Crafting, Side Chapters (blue nodes) and Collecting Duel Stars. NEW! - This guide will focus more on using Coins and Free Cards from duels or treasure nodes. - Recommended to all players with limited Duel Points. earning some Card Points (at least 200 CP) from dueling friends to get key cards at higher Chapters. - Proceed by treating this guide as another deck of yours. - I suggest to finish the tutorial first before creating your custom deck to avoid game errors. - Activate your deck and exit the Deck Builder. Enter deck builder again then proceed below. around 700 Power and above. Refer to the screenshot above for sample monster and spell cards. - Now, I recommend buying some cheap Spells early on to quickly boost your monsters. - You will need some Card Points but don't worry, you already have enough free CPs. - Don't forget to click "Save" to let the game update your custom deck. through the game. You don't need to buy any cards, just use the rewards from duels and treasure nodes. Next, get the below Monster cards (with effects) from rewards. - This is how your deck should look like after finishing Chapter 10 Node. - If you received any of the cards above, add them to your deck. - Monster effects like "Boost All" and "Cripple All" can really help you win duels. from rewards. Sell all monster cards (no effects) with less than 501 Power. Conserve your Coins and Card Points for stronger cards at mid and late game! (earn about 200,000 Coins). 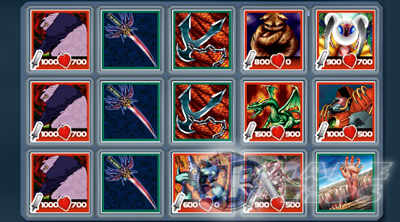 get 3 Spell Cards including Mirror Force!, with only 20 Duel Points. If it's not available anymore or the price went up, replace Mirror Force below with any Boosting Spell or monster card with "Shared Fate", "Requiem" or Destroy Monster effect. expert challenge and 20+ DP from the the duel star challenge. That is a total of 59 DP! deck will do just fine, but if you are having a hard time, try these tips. - You should already have "Shared Fate" monster cards (anti-creature). Use them like Fissure. - "Shared Fate" cards: Wood Remains, Mech Mole Zombie and The 13th Grave. 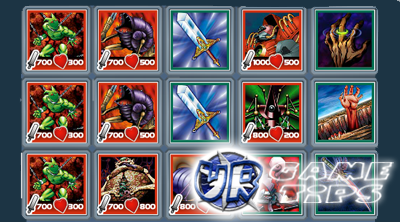 - Replace all spells (except Fissure or Mirror Force if you have) with "Requiem" monster cards (temporary). Bring your Spells back after that Chapter. - Use Fissure on a channel and do not place any monster cards on that same channel. destroyed by your opponent's "Shared Fate" monster cards! - At the near end of the Chapter, you'll encounter a "Boost" Dragon Deck. - Now, I recommend to start buying cards with good Life Points and with Anti-Spell effect. destroy those powerful dragons, specially "Wicked Dragon with the Ersatz Head". Do not boost your "Shared Fate" cards, just let your opponent kill them! - Your aim is to set and build up your monster's Power before your enemy does to win. you'll survive. "Destroy" cards can't destroy "White Hole" cards but they can destroy other spells. With some luck you'll complete this Chapter. After this Chapter, replace "Lesser Dragon" and "Wood Remains" with "Empress Mantis"
"Three-Legged Zombies" and "That Witch Feeds on Life". - You should be close to around 10,000 Life Points for better survivability. "Requiem" monster card on the field that has no opposing monster, then let your opponent kill it. This will destroy his or her monsters! destroyed by your opponent's "Shared Fate" and/or "Requiem" monster cards! - Replace "Girochin Kuwagata" with "Stim-Pack" spell card. - Continue on till you get "Sky Dragon" and "Midnight Fiend". - Replace "Bio Plant" and "Three-Legged Zombies" with the above cards. - Buy 1 "Suijin" monster card from the Shop and replace "Empress mantis". burn themselves with their "Backfire" cards! Use Suijin and "Backfire" combos too. - In this Chapter, you can get another Mirror Force from a Duel node! - Replace "Stim-Pack" with "Mirror Force". - After getting "Dragon Zombie", replace "Dokuriozo the Grim Reaper" with the new card. - "Metal Guardian" is also good but it gives 0 Life Points and it's Backfire is a little high. - After getting "Dark Assailant", replace "Midnight Fiend" with the new card. - After getting "That Witch Feeds on Life", replace "Kojikocy" with the new card. - After getting "Ansatsu", replace "Dark Assailant" with the new card. encounter over 2000 Power monsters! will require some strategies and some Card Points to buy key cards for defeating bosses. Save about 200 CPs for the last Chapter. If you need more friends, comment with "Add Me" here at urgametips.com. let it go for now. If you want a dragon deck, you need more Boost All cards to make it work. 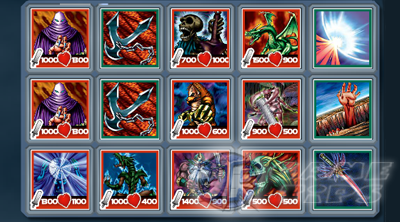 - Here you can also get another cool dragon cards, the "Curse of Dragon" and "Yamadron". - Both are good but let it go for now. You need to keep the balance and "Backfires". - I recommend to upgrade your "Sectarian of Secrets" cards. - Buy 2 "Akakieisu" monster card from the Shop and replace 2 "Sectarian of Secrets" card. - The last Boss node here will fight you with his Dragon Deck with Raigekis and more! - Replace "Sky Dragon" card with "Wood Remains". - Replace the 2 "That Witch Feeds on Life" with "Ansatsu" and "Dokuriozo the Grim Reaper". - Just survive and if your lucky, he'll just burn himself with backfires! - Don't forget to use "Get Help" from friends and some Power-Ups from gifts too. "White Hole"! It's a very good card that can combo with almost all kinds of cards! - Decks here will focus on "Cripple", "Requiem" and "Shared Fate" to fight fire with fire! - Basically, your goal is to have more monster cards than your opponent in the end. - If you can draw Call of Darkness and Mirror Force asap, you'll get a high chance. 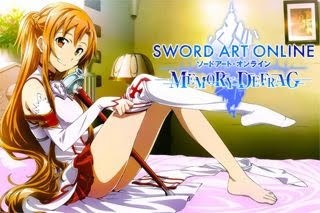 - To make it easier, buy some "Shared Fate" cards. - Buy 2 "Wood Remains" (60 CP each) monster cards from the Shop. placed Mirror Force, do not place any monster cards here. - As much as possible, do not place "Shared Fate" monster cards below those "King Fogs". let them "Cripple" your monsters instead to destroy stronger monsters. - Place "Requiem" cards on the left most channel if possible for better performance. - Place your "Call of Darkness" cards on the middle or on the right most channel. 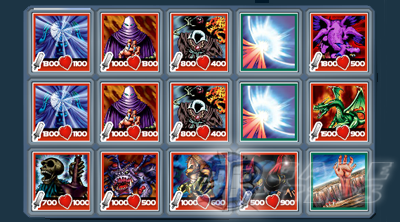 - The best chance to use your White Hole card is when you have 3 monsters in the field. - Use Get Help from friends or Power-Ups if it's a very close game. Good luck! - In case that both of you end up with zero monsters in the field, use BAM and "Get Help"
until you defeat your enemy. Good luck! - The easiest way to win this, is to use "Exile of the Wicked" cards. 2 "Call of Darkness" and one "Wood Remains". - Enter the Boss node and annihilate his top 3 Fiend monsters! - Place "Mirror Force" and "Exile of the Wicked" in the left most channel. - Same rule, do not place any monsters if you will use Mirror Force. - Use your "Shared Fate" or "Requiem" monsters to take out those Air Eaters and Fairies. - If "Just Desserts" shows up, use "Sectarian of Secrets" or avoid putting 3 monsters. - In case that both of you end up with zero monsters in the field, use BAM and "Get Help". - Claim another "Curse of Dragon" card and proceed to the END node! - What to do next? Collect and Build the most powerful deck that you can for future use! - New maps, new cards and new features will come soon!